I’ve said it a few times on this blog and I’ll continue to for as long as it rings true: not all the places recommended on TV shows and magazines are actually worth your time. In this case, it was Old San Juan’s Restaurante Raices. While planning our trip, this place popped up a couple of times while looking for places to visit. However, it wasn’t until I watched the Puerto Rico episode of Anthony Bourdain’s No Reservations when I was convinced to give it a try. 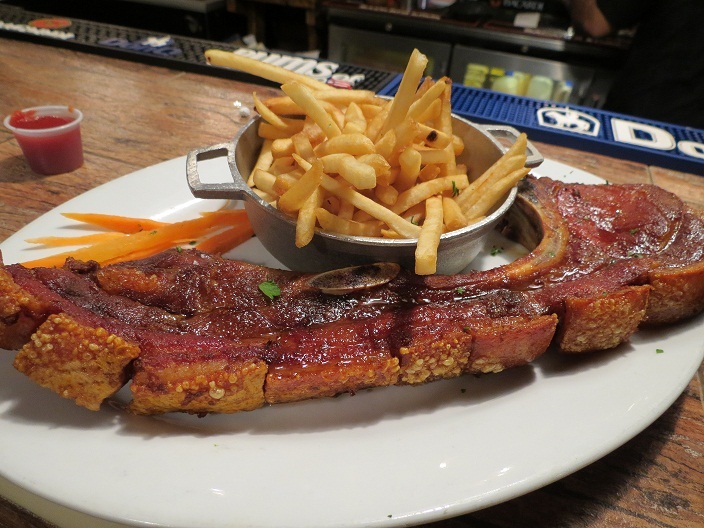 While I don’t always flock to places I see on the Travel Channel (take your food+travel TV with a grain of salt, folks), I was mesmerized by the giant pork chop laid before him after a night of drinking about town. Considering Bourdain shares my undying devotion to porcine delights, we went for it. Yeah, I was suckered in by a giant TV pork chop. Don’t judge. There was quite a wait for a table with a nice mix of tourists and locals; a few families celebrating birthdays in large groups. Our hostess asked if we wouldn’t mind eating at the bar where we could be seated immediately, which was fine by us. 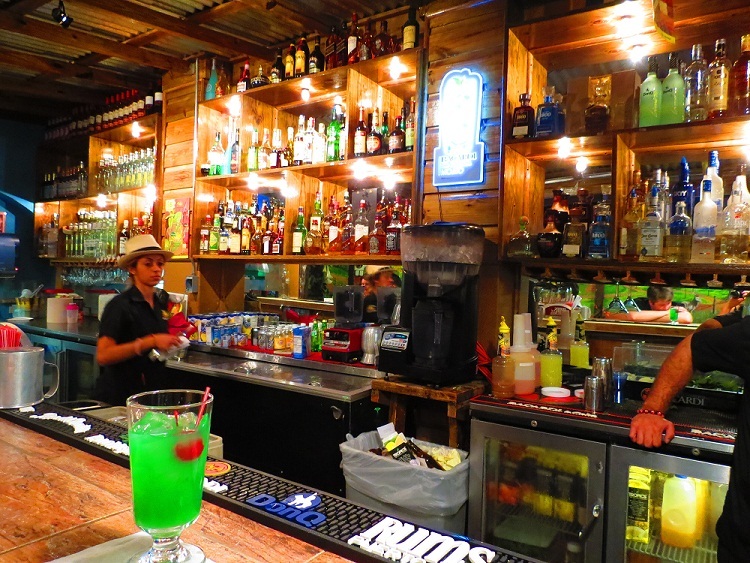 The decor inside Raices is very kitschy– but in a good way! Vivid colors, folk art, festive music, and staff decked out in old traditional costumes… seemed a little out of my comfort zone along the lines of authenticity, but was charming nonetheless. The bar area was a little more mellow, with a friendly English-speaking bartender who whipped up some serious cocktails for us as we awaited our dinner. 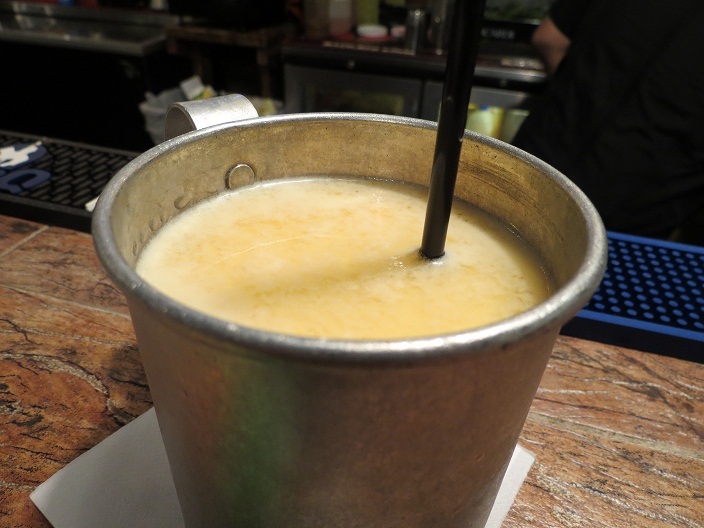 Unfortunately, when it came to balance and flavor, my drinks were more boozy than anything else. 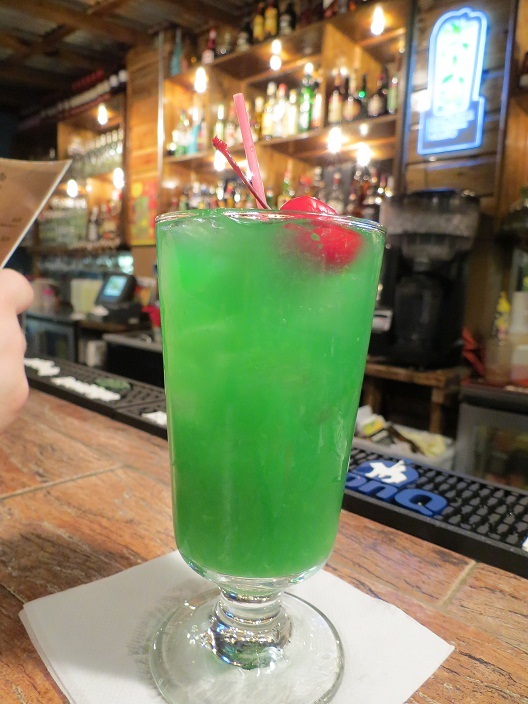 My pina colada was thick and came from one of those frozen margarita machines then topped off with copious amounts of rum, and the boyfriend’s cocktail (which he enjoyed) was nuclear green. A good place to get boozed-up, but if you’re looking for balanced drinks with flavor, then look elsewhere. Our entrees came out in a reasonable amount of time. I had been craving potatoes all week (having overdosed on rice, beans, and plantains) so I opted for fries to accompany my giant chop. From the looks of it, it was exactly as I had pictured it. However, the meat itself was pretty dry and overall, my meal was fairly lackluster. TV had let me down, but I suppose it was my fault for buying into its magic. 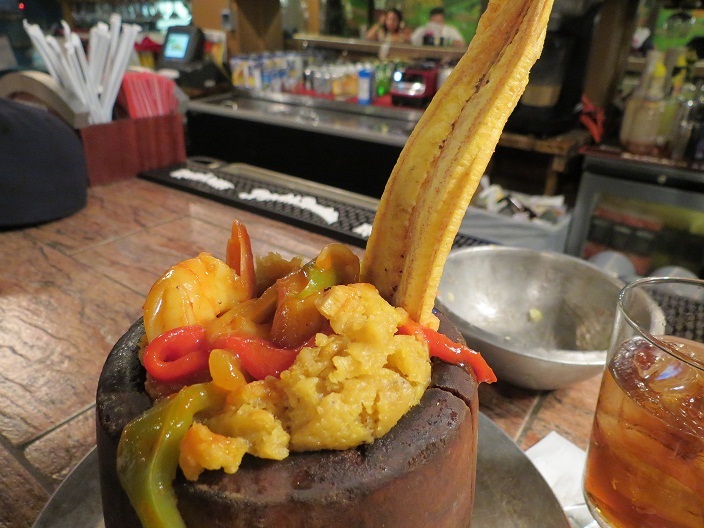 Their mofongo however, was delicious. The presentation, consistency, and flavors were bold and shrimp was plump and tender. Is it worth going out of your way to come here? Probably not. Is it a decent meal for when in the area? Yes. But skip the pork chop. Restaurante Raices is located at 315 Calle Recinto Sur, Old San Juan, PR.